If you discover Ads By Media Viewer, you should be worried about the advertisement supported software running on your personal computer. 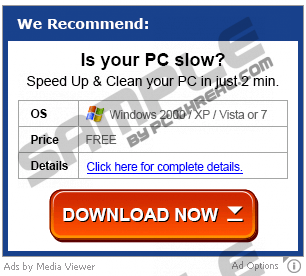 As malware researchers have discovered, if you notice this type of advertisements, it is most likely that a suspicious browser plugin presented via media-viewer.com has been installed onto your personal computer. Unfortunately, in most cases this application is installed without your knowledge as it comes packaged with other software. Needless to say, software bundled together with adware is not entirely trustworthy either. Therefore, we recommend that you remove Ads By Media Viewer related applications right away. As soon as Media Viewer is installed onto the Google Chrome, Mozilla Firefox and Internet Explorer web browsers, your Internet browsing sessions start being interrupted by irritating and obnoxious online ads. In fact, in some cases you might discover from two to five different advertisements on one single page, and this is considered to be extremely intrusive. What is more, many of the displayed ads promote the installers of unreliable programs which often travel bundled with undesirable and intrusive applications. If you are offered to update or install media players, we recommend that you use official download pages and ignore fictitious advertisements used to infiltrate malicious software. Note that these fictitious installers could be offered to you via Ads by Media Player and Ads by Media View as well. Whether you face banner advertisements or suspicious offers in new tabs, we do not recommend clicking on any of them before you are guaranteed that you can trust them. All in all, remember that different online advertisements have the same goals – to boost traffic to websites and to promote certain products. In some cases, online advertisements are trustworthy and reliable; however, in other cases, they could route you to unreliable sites. Due to this, virtual security experts do not recommend trusting any online offers, surveys, prize draws, installers, saving deals, etc. If you wish to delete Ads By Media Viewer, we recommend that you remove Media Viewer first. This application is responsible for activating the unreliable advertisements, and this is why you should deal it with it first. As our researchers have discovered, you can delete the undesirable program manually, and so we have prepared the instructions which will help you below. If you discover advertisements after the adware is deleted, we suggest installing automatic malware removal software to delete it for you. Navigate to the bottom-left corner of the screen on the Task Bar and click Start. Find the undesirable application you wish to get rid of and select Remove. Locate the Start icon on the Task Bar and click it to open the user menu. Access the Metro UI menu, right-click on the background and click All apps. Quick & tested solution for Ads By Media Viewer removal.